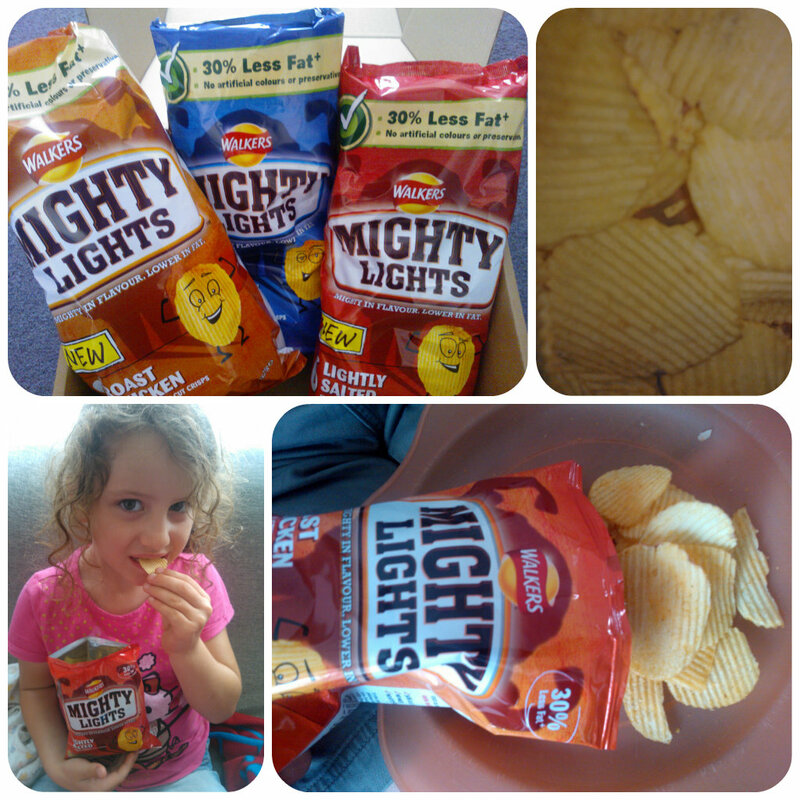 Everyone loves munching on some crisps for a tasty snack so when I was sent some of the new Walkers Mighty Lights crisps to try, I knew I’d have plenty of willing taste testers at home to give me their thoughts. With just 114 calories per pack and having 30% less fat than standard crisps these have got to be worth a try. For an everyday snack or lunch boxes, these are ideal knowing that you are eating a tasty snack that doesn’t pile on the pounds! It also means they are handy to keep in your bag for when you have that urge to snack or to have a pack with a glass of wine knowing you are not adding too much extra fat and calories to your day. Another bonus with these crisps are that all flavours are suitable for vegetarians, great seeing as me and husband aren’t meat eaters so it’s good to know we can enjoy these crisps just as much as anyone else. The Walkers Mighty Lights crisps themselves are made from real potatoes with no artificial colours or preservatives and are a source of fibre. Each crisp is ridged giving it that extra texture with each bite and they come in three varieties of flavours – Roast Chicken, Cheese & Onion and Lightly Salted. So time to taste and 5 yr old Miss M was first up eager to open a bag. She tried the lightly salted variety as she is not keen on too much flavour with her crisps. The packet didn’t last long as she sat there munching them and when I asked for her thoughts on them I got “Yummy, I really like them mummy”. Mister B also went for the Lightly Salted, and his verdict was “Mummy can I have some more”. Daddy tried the Roast Chicken and thought they were really quite delicious, definitely something he’d be happy to eat again. He said the flavour wasn’t too strong, there could be more but he was quite happy with them and said it actually meant that the flavour wasn’t overpowering. He really enjoyed the texture of the crisps being a bit of a fan of ridge style crisps. He also taste tested the Cheese & Onion, as this is one of his favourite flavours, and it didn’t disappoint. He’d happily eat these in his pack lunch at work each day. I tried them and although I have nothing particularly against them, they wouldn’t be my crisp of choice. I’d definitely purchase them again for the rest of the family as they all enjoyed them and knowing that they are that bit healthier than normal crisps, being 30% less fat, that is a bonus. I’d much rather them eat lower fat snacks if possible as that leaves room for other treats now and again. So overall, the Walkers Mighty Lights were a success in this house, something that had a good crunch and texture and enough flavour to keep everyone happy. A good choice of flavours too, something for everyone. We’d recommend Walkers Mighty Lights – why don’t you give them a try? This entry was posted in Reviews and tagged crisps, low fat, lunchboxes, mighty lights, ridged crisps, vegetarian, Walkers by Fiona Martin. Bookmark the permalink. We loved them here – got to get some new stock in! I agree these are lovely! Tried them too this week!